Bollywood actor Shahid Kapoor, whose upcoming film 'Haider' is set to clash with superstar Hrithik Roshan's 'Bang Bang' on October 2, feels that both the films can sustain together because they cater to different audiences. "I saw the promo of Bang Bang and I loved it and I will definitely go and see the film. I wished good luck to Hrithik. It is a five-day weekend, the five-day holiday period is coming after a long time and I think any big holiday weekend is good enough for two films to sustain. Two big films can release (together), there is no problem," Shahid said in an interview here. While Vishal Bharadwaj's Haide' is a desi adaptation of William Shakespeare's Hamlet, starring Shahid, Tabu, Irrfan Khan, Kay Kay Menon and Shraddha Kapoor, Bang Bang, directed by Siddharth Raj Anand, is a remake of the hit Hollywood movie Knight and Day, with Hrithik and Katrina Kaif in the lead. "I think if Haider is black then Bang Bang is white. What Haider is offering you that Bang Bang can't offer and vice versa. We are confident about our film. Our film is not very expensive so we have nothing to lose. So getting a five-day weekend is fantastic for a film like ours," Shahid said. The actor feels that both the films are of different genres and will cater to audiences with different tastes. "I don't think there is going to be any confusion for people. If people want to see something edgy, different and out-of-the-box then they will see Haider and if people want to see something entertaining, fun and a potboiler then they will see 'Bang Bang'. Had there been two similar kinds of films then it would be a different scenario but that is not the case here," he added. 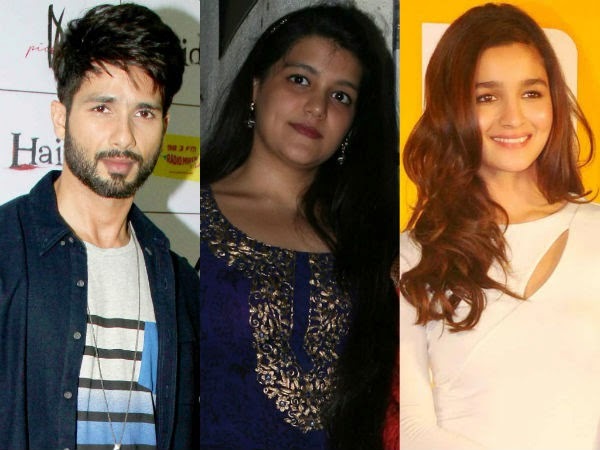 Shahid Kapoor has competition at home, from his half brothers and sister. While his mother Neelima Azmi's son with her second husband Rajesh Khattar, Ishaan, is gearing up for his Bollywood debut, Shahid's father Pankaj Kapur's children with his present wife Supriya Pathak, Sanah (23) and Ruhaan (20), have also got their eyes on the silver screen. Confirming this, Pankaj said: "Sanah and Ruhaan have trained in acting. Sanah took a course in New York City, while Ruhaan honed his acting skills in London. I am so proud of them." So, will Pankaj direct a film for them? Pat comes the reply, "I definitely will. But not right away. I think they should first make a place in the industry on their own." Added the friend; "Pankaj didn't direct Shahid when he started out though if he had wanted, he could have. He believes that his children should stand on their own feet without his help. That will make them stronger." Pankaj's previous and only directorial venture Mausam (2011), starring Sonam Kapoor and Shahid Kapoor didn't fare well at the box-office.